Anthony Carpinelli appears distraught in court Wednesday. SPRINGVALE — The Sanford man who is accused of felony assaults that left his twin infants hospitalized with serious injuries appeared in court by video conference Wednesday. Anthony Carpinelli, 21, of 25-C Bates St. said little during the hearing but was seen on a television screen sniffling and wiping tears from his eyes. He appeared in Springvale District Court via a camera in the York County Jail, seated beside his temporarily appointed attorney, B.J. Broder. 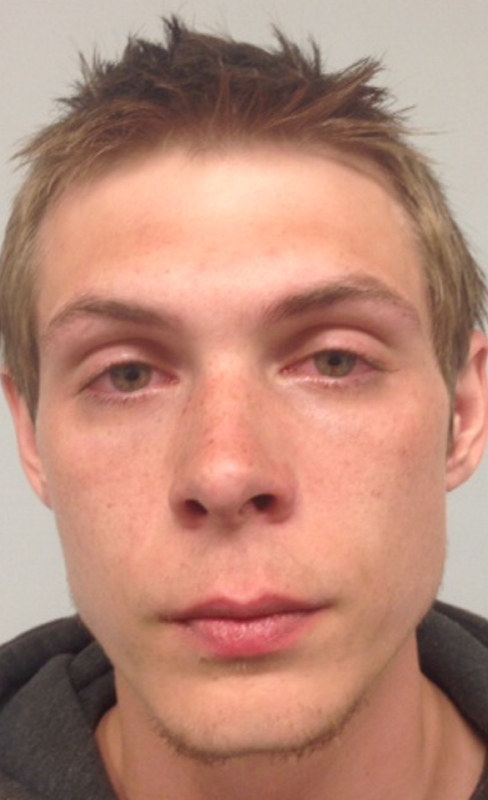 Police say the 2-month-old twins were hospitalized Friday after Carpinelli hit and shook them. Judge Andre Janelle ordered Carpinelli held on $25,000 cash bail or $100,000 property until his next scheduled court date, Aug. 15 in York County Superior Court in Alfred. Broder asked that another attorney, Randall Bates, be appointed to assist Carpinelli until his court appearance. “Mr. Carpinelli is quite distraught, frankly,” Broder said. The judge set the bail amount requested by the prosecutor, Assistant District Attorney Tanya Pierson, and added several conditions, including that Carpinelli have no contact with the infants, Willow and Haiden Carpinelli, who were born prematurely on March 11, or with their mother, Nichole Morrill. Carpinelli said only “no, your honor” twice during the hearing and otherwise let Broder answer questions the judge posed. No one from Carpinelli’s or Morrill’s family appeared in court. The only people in the spectator section of the courtroom were members of the media. Carpinelli has been in custody since he was arrested at the Sanford Police Department on Monday. Pierson denied a request from the Portland Press Herald to release any additional police reports or details of the accusations against Carpinelli, beyond the complaint filed with the court. The two-page complaint lists Carpinelli’s personal information and the charges against him: two counts of aggravated assault on a child younger than 6 years old and two counts of assault on a child younger than 2 years old. The aggravated assault charges are punishable by as much as 10 years in prison. The assault charges are punishable by as much as five years in prison. Carpinelli was not required to enter a plea. The next step in the case would be for the District Attorney’s Office to present it to a grand jury to seek an indictment. Carpinelli was with the children Thursday night while their mother was out, said Sanford Detective Cpl. Sarah Roberts. Morrill returned Friday morning and found the children in distress. She took them to Southern Maine Health Care in Biddeford. The infants were transferred to the Barbara Bush Children’s Hospital at Maine Medical Center in Portland. Willow had a serious brain injury and was initially in critical condition, said Sanford police. She was listed in serious condition Tuesday, but a hospital spokeswoman said she had been discharged to her family. Haiden had less-serious external head injuries, police said. He was initially in serious condition but also recovered enough to be discharged, the spokeswoman said. Morrill declined to speak to a reporter Wednesday when contacted through Facebook. Morrill included a link to a campaign on gofundme.com, a fundraising website, to raise money for a permanent home for her and the babies. The creator of the campaign, Judy Bumby, said on the campaign page that the twins were recovering. Carpinelli and Morrill lived with the twins and a 2-year-old daughter in a single room at Morrill’s brother’s home, police said. The 2-year-old was not injured. John Martins, spokesman for the Maine Department of Health and Human Services, said Wednesday that information on any ongoing investigation in the case, or whether the DHHS had investigated any prior incidents of abuse involving Carpinelli, were confidential. Staff Writer Eric Russell contributed to this report.